The corundalope is probably the rarest of all known corundums. An endangered species, it may nowadays be found only in laboratories. This specimen is cared for by Union Carbide's Milan Kokta (left) and Jeff Cooke. Betwixt two worlds: A search for gemology in the 21st century by John L. Emmett and Richard W. Hughes. Bipolar gemology. Spinel: Resurrection of a Classic by V. Pardieu, with R.W. Hughes and E. Boehm. This overshadowed gem builds a name of its own. Working the Blueseam: The Tanzanite Mines of Merelani by V. Pardieu and R.W. Hughes. The insane gem posse on the trail of true blue in tanzanite country. 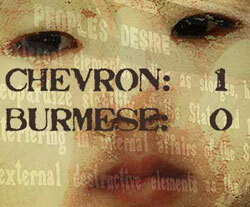 Chevron: 1; Burmese: 0 by Richard W. Hughes. A look at politics, gem style. Dangerous Curves by Richard W. Hughes and John I. Koivula. Verneuil synthetic corundum reexamined. Brilliance, Windows & Extinction in Gemstones by Richard W. Hughes. Important cutting phenomena examined. Trust by John L. Emmett & R.W. Hughes. A brief essay on the ethics of of gem treatment disclosure. Moon Over the Pamirs by R.W. Hughes and Vincent Pardieu, with Guillaume Soubiraa and Dana Schorr. The insane gem posse hits the trail in search of the lost mines of Marco Polo, finding spinels, rubies, and something far more valuable. Sorcerers and Sapphires: A Visit to Madagascar by Richard W. Hughes. Join the author as he pays a visit to the ruby and sapphire deposits of the lost island of Madagascar. Heat Seeker: UV Fluorescence as a Gemological Tool by R.W. Hughes and J.L. Emmett. One of the challenges gem dealers and gemologists face today is to identify heat treatment. The authors examine UV fluorescence as an economical, yet powerful heat-seeking tool. The Kimberley Process: Appeasement comes to the diamond trade. Think the diamond trade is concerned about human rights? Think the Kimberley Protocols will fix the issue of “conflict” diamonds? Think again. Charles Ellias and Richard Hughes dissect this issue with the surgical precision of a US military bulldozer redecorating an Iraqi neighborhood. Banned! Burmese gems in the crossfire by Richard W. Hughes and Brian Leber. The case for sanctions against Burma seems to be obvious. But the reality may be less so. In this pair of articles, the case both for and against sanctions is examined. The Skin Game. When something appears too good to be true, it usually is. And that was precisely the case with the treated orange sapphires that poured out of Thai burners' ovens in 2001. Love and Hate. Max Green's stolen millions and the Lao sapphire mines. Seeing Red: A Connoisseur's Guide to Ruby. Richard Hughes casts a discerning glance at the qualities that make ruby the most sexual of all gems. Conspiracy Theory: Gems & Junkies in Burma. Should the world boycott Burmese gems? In a searing personal essay, Richard Hughes examines that question with a look at the relationship between the gem and drug trades in Burma. Heat Wave by Richard Hughes. A different take on the heat and Burma rubies. Part 1: Burma's Jade Mines By R.W. Hughes, O. Galibert, G. Bosshart, F. Ward, Thet Oo, M. Smith, Tay Thye Sun and George Harlow. Fully illustrated. Don't Forget to Flush. The Digital Devil takes a fresh look at emerald enhancements. Spinel. Kurt Sickafus & Richard Hughes dismantle the history of a most interesting gem material. Part 1: Burma's Jade Mines A groundbreaking article on the second-most valuable gem in the world – Burmese jade. By Richard Hughes, Olivier Galibert, George Bosshart, Fred Ward, Thet Oo, Mark Smith, Tay Thye Sun and George Harlow. Fully illustrated. Pigeon's Blood A Pilgrimage to Mogok – Valley of Rubies. Illustrated. Seeing Red A Connoisseur's Guide to Ruby. Richard Hughes casts a discerning glance at the qualities that make ruby the most sexual of all gems. There's a Rumble in the Jungle More on surface-diffusion treated sapphires. Trust by John L. Emmett. A brief essay on treatment disclosure. Weapons of Mass Donation by Randolph E. Post. Of politics and pearls in Burma. Big Time: Are these huge ruby and sapphire crystals worth anything? Read all about 'em. Blood From A Stone: Finally the truth about blood diamonds. C3: I See Thru U: The devil dismantles synthetic moissanite and the threat to the diamond trade. Carbon Copies: The devil dissects the new GE/LKI diamond treatment. With reader commentary. Heat Wave: The heat and Burmese rubies. Passion Fruit A Lover's Guide to Sapphire. Richard Hughes dissects the qualities that make up a fine sapphire. Cry Freetown: A poem by Todd A. Pownell. From Russia with Jade. A journey to Russia's jade mines. By Richard Hughes, with Nickolai Kouznetsov. Blood From A Stone. What's up with these so-called "blood diamonds?" Richard Hughes puts them under the Devil's microscope. Have I Got An Idea For U. National Enquirer comes to the diamond business? Read all about the attempt to peddle GE/POL diamonds at prices higher than the natural gems. C3: I See Thru U. Does synthetic moissanite scare the bejesus out of you? Fun Down Under. What do Henry David Thoreau and Australian opal miner Lenny Cram have in common? Find out here.